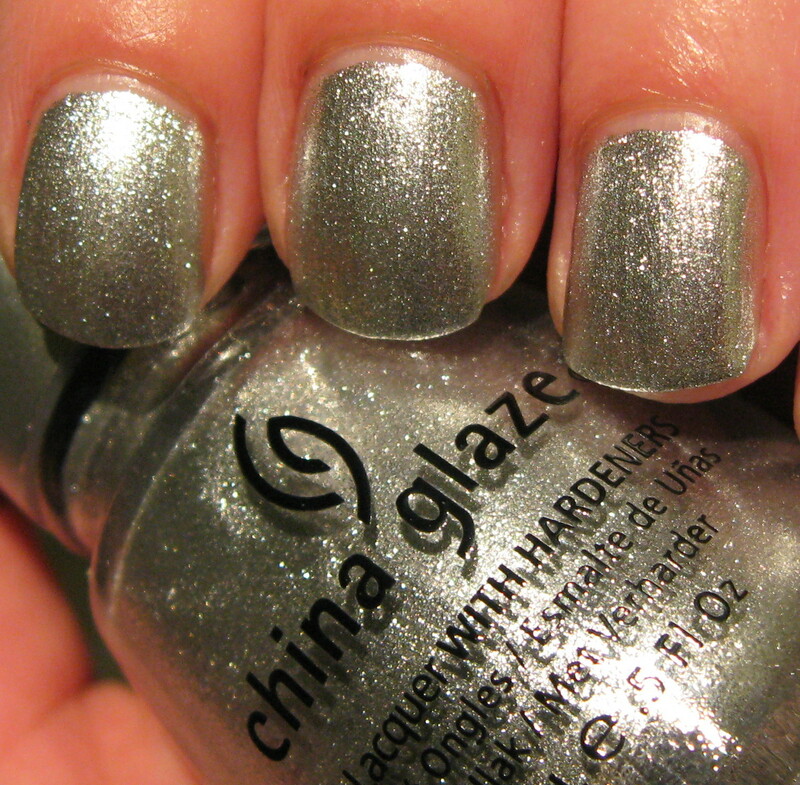 I have 3 more shades from the China Glaze 'Tis the Season Holiday 2010 Collection for you today. As I've been doing each time I swatch shades from this collection, you can leave your eMail in the comments section if you'd like to enter for a chance to win all three of them. Entries are due by midnight 11/20/10 and the winner will be announced on Monday. Below: Little Drummer Boy is a little darker than I'd imagined based on the promo photos, but it's a lovely dark cadet blue shimmer that applied nicely using 2 coats. I'm finding all of the shades in this collection to be highly pigmented and the formula is very good. Below: Jolly Holly--you'll notice I called it Holly Jolly in my photo collage above, oops!--is a rich darker emerald green shimmer that has a nice holiday glow to it. 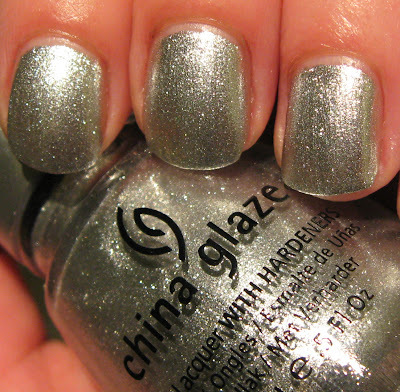 Below: Cheers to You, a bright crushed silver foil shade is similar to many other silvers that have come out lately with this same type of finish (Sally Hansen Metallic Momentum, Barielle Night Moves, Quirius Black Coal, and Orly Shine to name a few). Again, very nice coverage on this. Below: Or, if you're wanting a little different look using all 3 of these shades, mix yourself up a cup of eggnog (heavy on the rum or whiskey)and start looking around for household objects that can double as nail art tools! 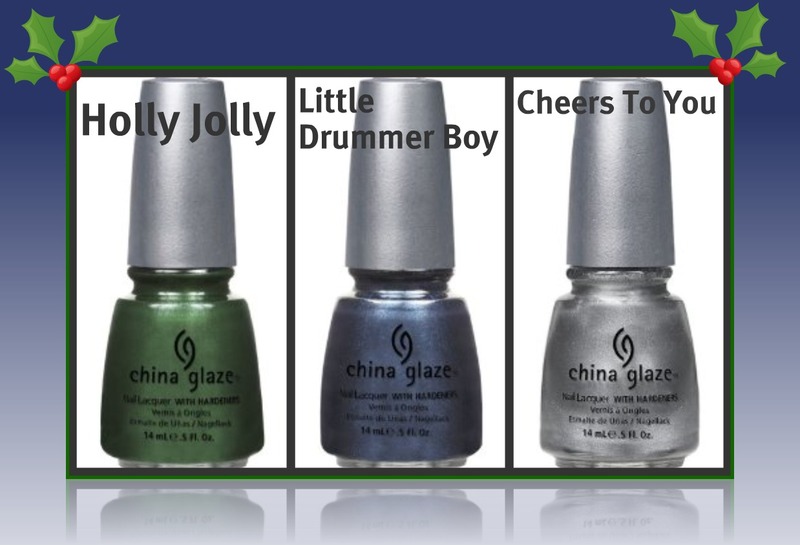 Below: Brush a bit of Little Drummer Boy and Jolly Holly on the edge and roll it or dab it over each nail that you've already painted with Cheers to You. Below: You might want to do a little neater job than I did, but you get the general idea! All three of these shades are winners in my opinion. They're probably dupish to other polishes out there, but they're just different enough that I didn't find anything identical in my collection. The formula and price can't be beat either! I love Jolly Holly and Little Drummer boy! This collection has some very pretty shades. I really like little drummer boy. Ooh and it looks fun the way you used the sponge to create nailart with the colors! 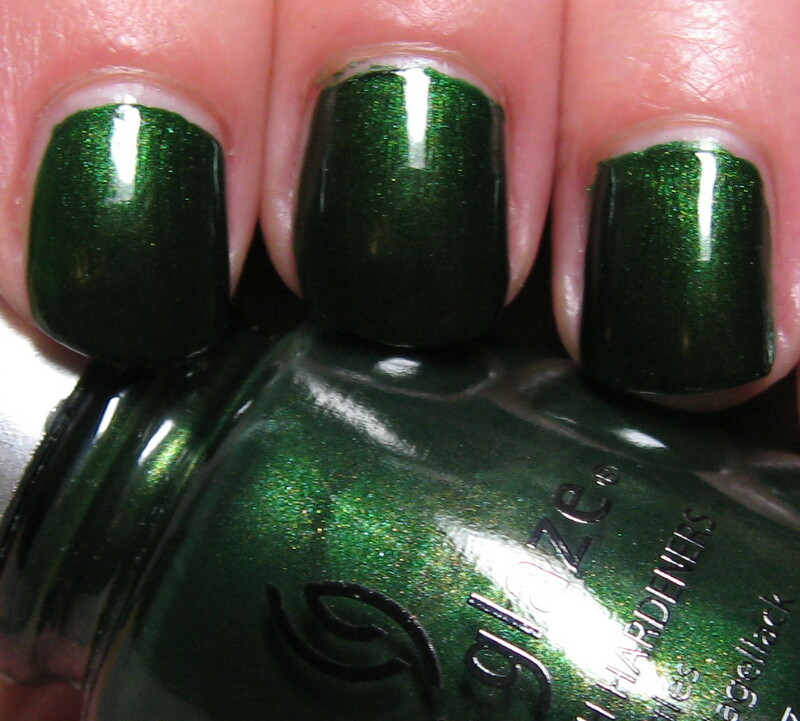 I must go get the greens from this collection! I might give in to temptation & get the blue, too. I'm weak, I know! :) LOL! Little Drummer Boy is fantastic! I love the sponge idea! I gotta try that! 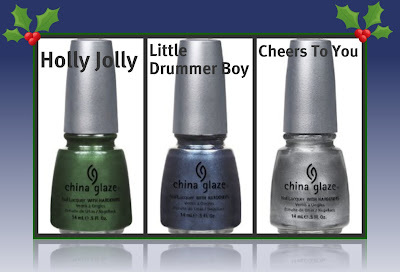 I love Cheers to You and Little Drummer Boy! I love these! Great idea on the effect! Don't forget to head over and enter my Christmas giveaway if you haven't already! I follow via GFC with my GMail address and can be reached at extemter at hotmail dot com. Ooh! I love them all! 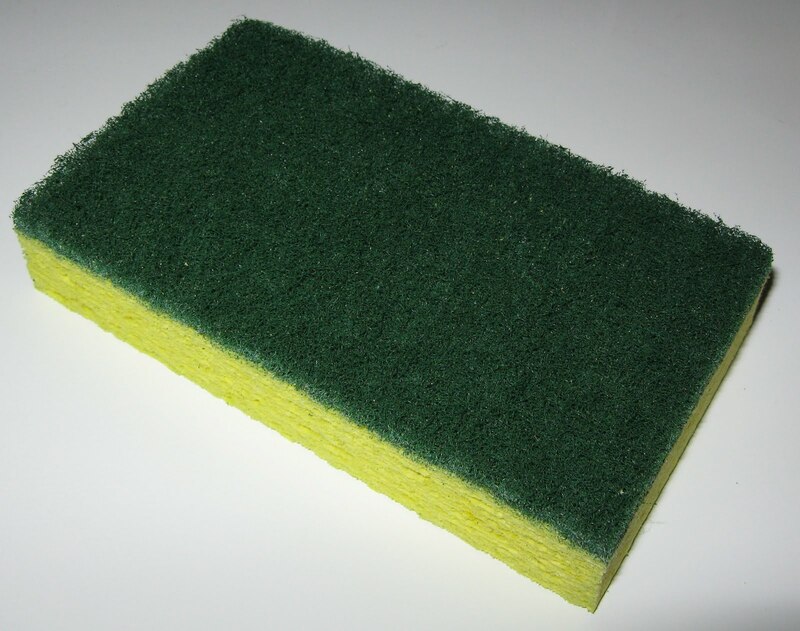 The sponge thing looks really nice! 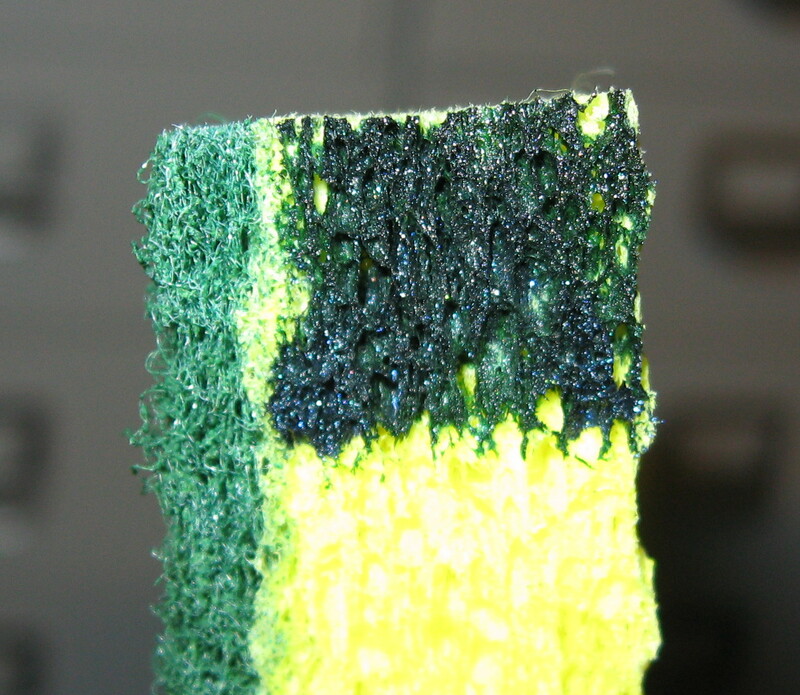 When I saw the sponge picture posted I was expecting disaster. Pleasant surprise! The shades from this collection are just to die for! This is one awesome collection. Love them all! They are all amazing......would love to win them! I've got all three of these colors, so good luck to everyone else - and whomever wins, congratulations!! These are all lovely shades. I'm next going to try a gradient-look with Jolly Holly, Frosty, and Snow (using some ubercheap sponge eyeshadow applicators to apply the white polishes.) Should prove interesting! 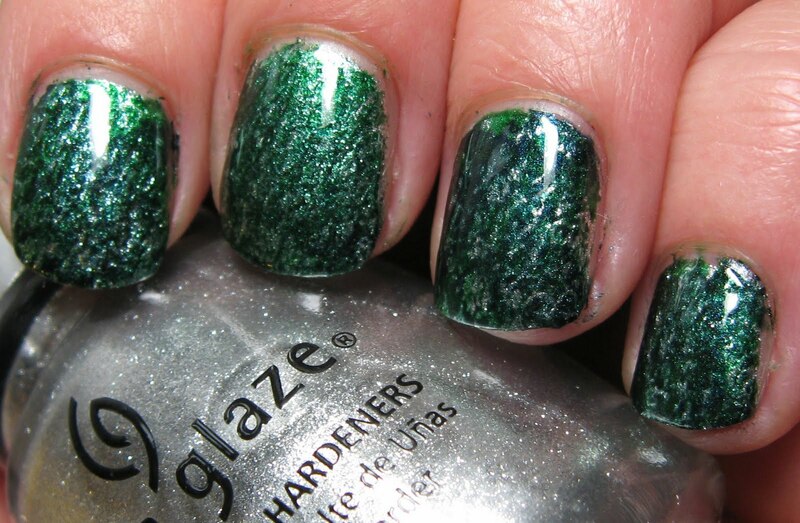 Wow, the sponged manicure was really cool! Plus, I'm gonna try that sponging thing for myself, loved it! All three are so gorgeous!! Please include me in the giveaway. Love that nail art. Thanks Mary! I love how the sponging turned out! It looks great. The sponging turned out really cool looking! Little Drummer Boy is definitely my favorite of the bunch, loveeee that blue! I love the household object nail art. Eggnog+nail art=win! Thanks for this giveaway! I love Jolly Holly!!!! I wonder if its close to Emerald Fitzgerald? You're so funny - grab some egg nog... and a sponge! I'm inspired to do some sponging and egg nog sipping now. People keep saying that Little Drummer Boy doesn't feel very holiday to them, but it definitely does to me. Blue, silver, and green are my favorite holiday colors. I love Little Drummer Boy, it's an incredible blue! Please include me in your giveaway, my email's cherylcherylcheryl at gmail dot com. Thank you! I love all the shades in this collection! Of the three, Little Drummer Boy is my favorite! I'd like to enter your giveaway! Please enter me, and be thanked a hundred times for your generosity!! please enter me in the drawing pgreenlee@wi.rr.com. awesome giveaway!!!!!! All great colors! But I love Little Drummer Boy! Hi, I'd love to enter, my email is fashionpolish@gmail.com Good luck to everyone. xoxo. The 3 colours look wonderful! Must have that green.. and the blue is amazing too. Looked for the whole collection at Sally's yesterday, but they had nothing. Please enter me, these are gorgeous! I really love Jolly Holly, but I always love greens! Pretty colors! Please enter me in the giveaway.